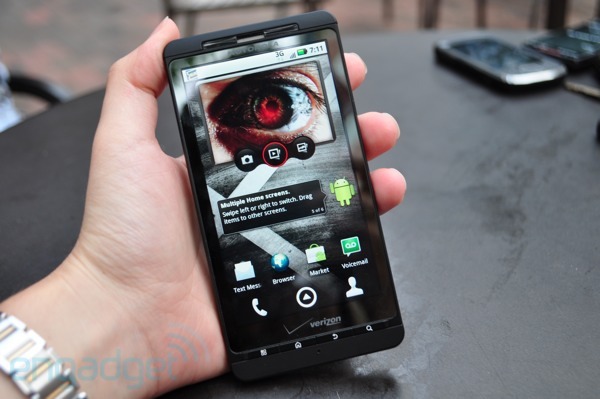 Engadget appears to be the first tech site to get a hold of the new Droid X by Motorola long enough to do a quick writeup. They put this beast to test by showing off it’s 720p video capabilities, new Motoblur, its size in comparison to competitors, a new keyboard, and so much more. This comes only hours after we broke the release date news and the official announcement which is coming next week. Hardware: Looks slightly bigger than the EVO and has far more exterior details. Screen: Might actually be 4.4″ and is incredibly crisp. Motoblur: Running Android 2.1 and not what anyone expected but seems to be solid. Camera: 8MP is nice, but the actual camera button made pics unclear at times. Keyboard: Official Swype comes preinstalled and includes multi-touch. Performance: The speed is remarkable. Like I said, they put together a pretty good review for only having the device for a short period of time. They also have videos and an entire gallery that you must see. Check out the rest of their writeup here.